1978 : Beginning of small work shop for testing of Fuel injection equipment in automotive industry. 1983 : Recognized as Authorised workshop. 1991 : Beginning of New venture again another workshop of Fuel Injection equipments in Kolhapur. 1994 : Diversified activity with Power tools sales and service. 1996 : Another authorized Fuel injection workshop at Islampur. 2001 : Another diversified activity with construction services. 2004 : Another diversified activity of entering in to telecommunication line. 2007 : investments made in Construction services business for Vibration free concrete cutting. 2008 : investments made to be able to repair euro complaints vehicles. 2008 : Strategically alliance with CFS UK. 2013 : New brand named - ICFS - Indo Construction Fastening Systems brought into existence. 2014 : ETA approval for ICFS brand Chemical products. 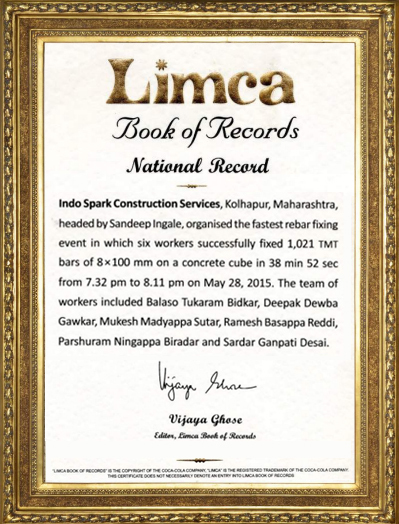 2015 : Limca book of records for highest number of Rebaring. Godown : Rental at 1600 Sq ft at Tararani chowk. Our approach is planned, calculated and secured. We are aggressive, but conservative at the same time. We are fast to adapt to the ever-changing customer requirements. We know that our success will depend on being able to continue winning your trust and confidence. Experience in business for over 47 years. As a care taker looking after business. Experience in business for over 25 years. Looking after business to make it more profitable. II. Computer : firm is computerized. Our group of companies has experienced strong and sustained growth since its inception in 1978. Our satisfied customers have always considered us as reliable business partner and this confidence has inspired to grow further and achieve higher goals. In all these year our strengths & experience has made us well confident to face the new challenges.